No search engine marketer worth their salt would tell you a definite answer to this question. If you’re a small business or startup owner, which should you go for – PPC or SEO? Is it the chicken or the egg first? A faction of the crowd will tell you, pay per click (PPC) is the quickest and easiest way to get on top of search results, and more importantly clicks and conversions. Then there are the diehard search engine optimization (SEO) faction who’d swear by SEO’s stability and long term returns with consistent leads and customers. What’s Jack to do? Well, I’d advise Jack to sit tight and hear me out. Not only myself, but I’ve managed to gather a bunch of experts to share their golden nuggets. 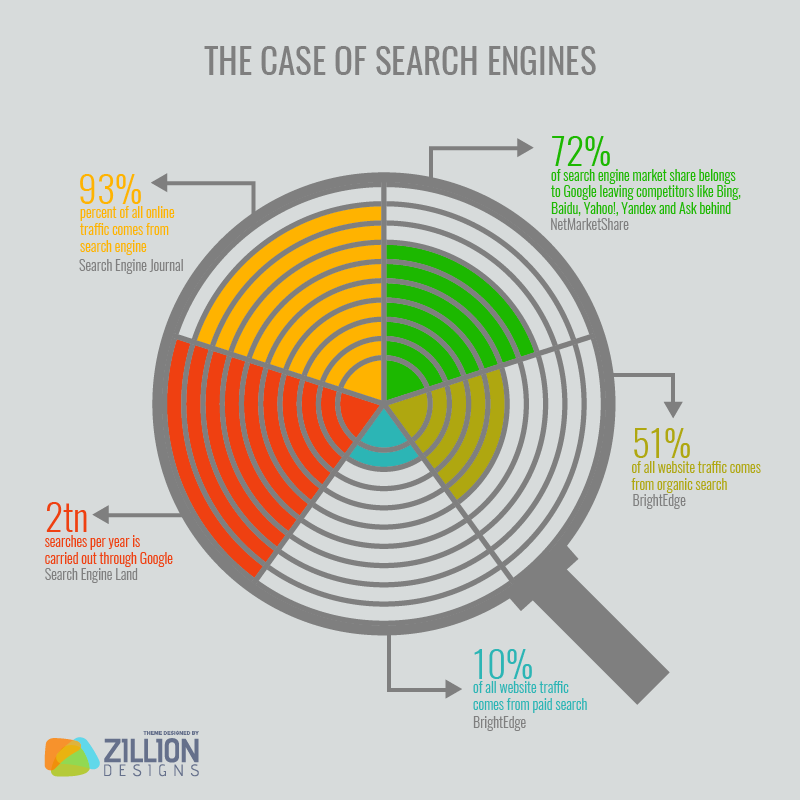 For those who’ve never really understood what’s the big deal about search engines here are a few stats to chew on. To say that Google is kind of a big deal is an understatement. Google is THE only search engine worth exploring. But where there are 2 trillion searches per year, how do you compete for the attention of your searchers? There are really only two ways to get your website in front of your target audience on Google: SEO or PPC. The term “free” here is relative so don’t go getting ideas that you could get free traffic. In fact, you’ll have to invest in quite a lot before you can get a decent stream of organic traffic mentioned here. PPC on the other hand is “a model of internet marketing in which advertisers pay a fee each time one of their ads is clicked” — Wordstream. Whether you choose Google Ads, Bing, or Yahoo! etc. they all work the same way. As long as you pay, the search engine will send traffic to your website. When you pull the plug, aka stop PPC money flow, traffic drops like a hot brick. Now that stats and definitions are out of the way, let’s dive into the heart of the matter – SEO vs. PPC. Actually, there is no such thing as “versus” (gasp!) but we’ll touch on that later. Before we discuss SEO or PPC, there are a couple of things you need to keep in mind. 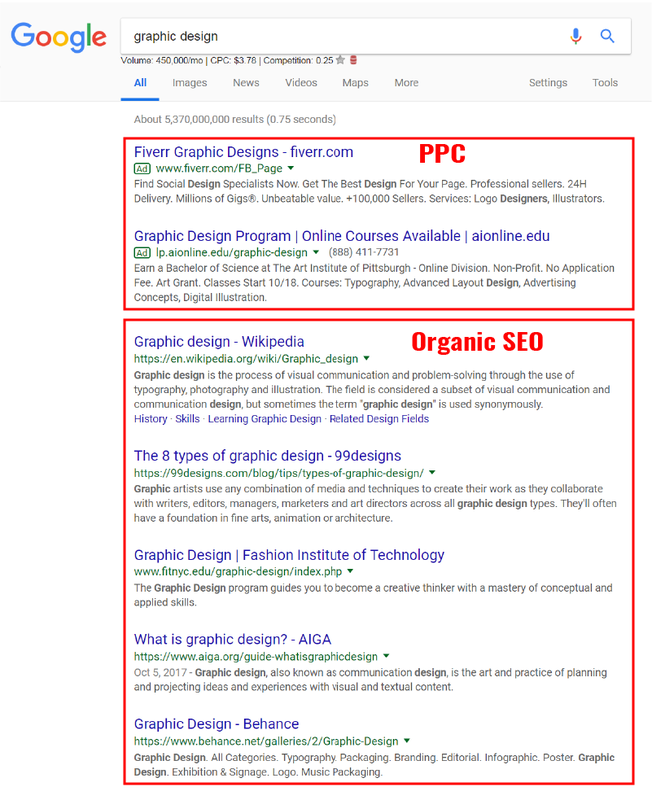 First, organic search engine result pages (SERPs) list ten sites on the first page, then you move to second page for another ten, and so on. And let me tell you, the first page is the only one worth being seen in. Click through rates (CTR) drop dramatically as you move away from the top five position of the first page. Considering there are 1.24 billion websites around the world, it’s tough for a newly established online business to compete for organic results within your industry and country, let alone the world. Second, paid ads get listed through a tough process called keyword bidding, and appear at the top of SERPs in sets of two, three or four depending on the competitiveness of the keywords used by advertisers. Google also gives the option of listing ads at the bottom of SERPs. The higher the bid, the higher your ad will be placed on the page. Now, let’s consider Jack’s (or any startup or small business owner) situation here. Jack has a limited budget for marketing his newly developed website but he needs customers fast to even out startup costs and sustain his business. Assuming Jack is not that well versed with SEO techniques and processes, he’ll have to spend around $5000 or more per month for some time to optimize his website for organic traffic before he can expect to receive decent number of leads for conversion. But he doesn’t have the time. Neither does he has the money, for that matter, to spend $100 per day (a conservative amount) to get customers through PPC. Here’s what Jack should do according to the experts. When considering a choice between SEO or PPC, the first thing that a business owner must do is evaluate their goals and business lifecycle. To begin with, Ulysis Cababan, SEO Specialist of RapidVisa.com recommends, “A good old competitor stalking is ideal too so that you can create a strategy which is better than your competitor…” Find out where they are investing their money in – SEO or PPC? What kind of keywords are they focusing on? And more importantly, are they into generating sales, traffic or brand awareness? These will give you clues as to where to start. Generally, depending on your product or service type, there are three approaches to an SEM strategy (search engine marketing). If you’re looking for fast converting traffic then there is no better way than PPC. With tools like Google Ads, you can pretty much narrow down your PPC budget to a niche that your competitor is targeting, and access matured and ready-to buy audience. You can even experiment with A/B testing to optimize your PPC dollar and cents to cover special niches as well. SEO takes longer to bring in target audience, and even a longer time to ready your audience for conversion. This leads us to our next point. If your goal is to build a steady stream of traffic to your website through rankings to generate an average of X number of leads or convert $X amount per month, and you have the patience for it, then SEO is your best bet. Makes sense because every entrepreneur aims to have a long lasting business entity; no one is looking for a burse and fizzle out. Plan your SEM strategy like you’d plan your marketing strategy. This is one of the most neglected aspects of SEO or PPC. While there is a huge difference between brick and mortar, and online marketing, the basics are still the same. The customer is at the heart of the strategy. In a customer’s world, never discount the buyer’s awareness of the brand which helps in making the purchase decision. 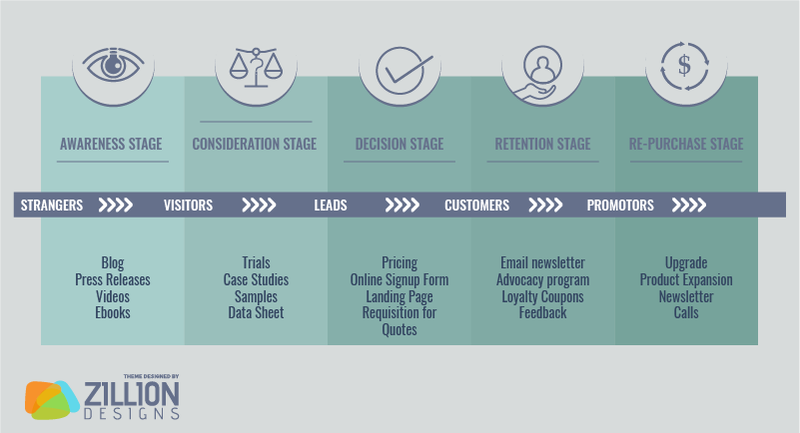 Involving your customers in your brand requires following the buyer’s journey. If you’re wondering what it is, here’s what it looks like. In this journey you’ll notice that information related to a brand is key, which comes from content. Lots of content like product details, how it works, ebooks, case studies, testimonials, reviews, comparison, pricing, how to buy and more, help create brand awareness. The aim is to create authoritative, expertise and trust worthiness for your business among your target audience. And lucky for you, Google understands this, which is why content always ties up nicely with both PPC and SEO. And there you have it. SEO and PPC don’t work in isolation. It’s becoming obvious even to experts that SEO and PPC work in collaboration to boost the business as a whole. With that thought in mind let’s explore how they work out together. Once you have your SEM strategy in place, it’s time to decide how you want to make your brand visible. Going the SEO way means you’d have to conduct deep research on keywords, both commercial and organic, related to your business. 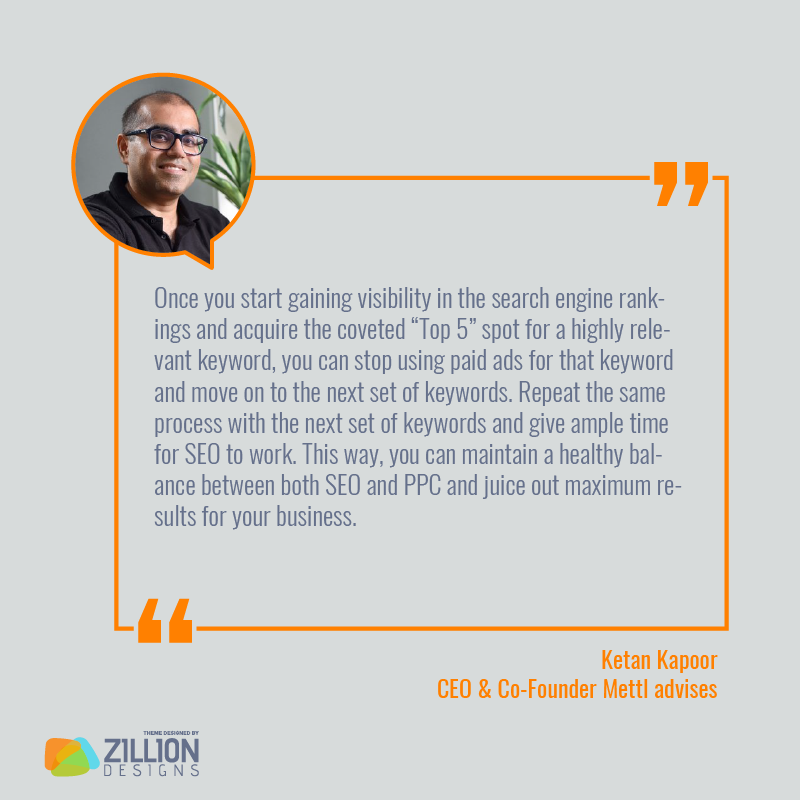 Then use the keywords to optimize your website for on-page as well as off-page. The idea is to be visible in your target audience’s search queries with variable types of long tail and specific commercial keywords. Optimize your website for high volume keywords to increase your brand’s visibility. Despite these tactics, there is no guarantee that your SEO tactics can compete with competitors. That’s where PPC comes in. To get razor sharp brand visibility through PPC you’d need to feed in keywords in your campaign based on research on search volume as well as your target audience’s profile: time of day, day of week, gender, age, geography, language, and device used for search queries. Here’s where it gets tricky. When you set up your PPC campaign, you have to aggressively bid against competitors in the same niche. The higher your bid, the higher the position of your ad. But that still doesn’t guarantee you’d get conversion from your target market. Your creative ad copy, landing page, CTAs (calls to action), pricing, and visual presentation all contribute towards the great quality score which Google uses to determine whether your ad is relevant to the searchers or not. That means you’d be spending a ton of money for a top position with the risks of not getting clicks at all. As a startup or small business owner you can’t afford to do that. Wait on Jack, there is more. SEO ranking for commercial keywords is highly difficult if you specialize in niches like dental, legal, graphic design, healthcare etc. Being number one on Google’s SERP is a coveted position because the difference between number one and number two is almost half the clicks. Instead, you’d be wise to use on-page and off-page activities to target long tail keywords that is a mix of commercial and organic search queries, and easier to rank for. Even so, one of the most difficult problems that SEO experts face is having their optimized website listing being sandwiched between PPC ads in SERPs. Ketan Kapoor, CEO & Co-Founder Mettl advises. That means the rest of 34 percent is most likely not going to get clicks at all. To solve this problem, you could do A/B testing. In PPC it’s easy to split test ads and determine whether your ads are effective in getting your desired audience or not. Alter your keywords, ad copy or landing page for testing, and set it up to show in split numbers. The good thing about A/B testing PPC ads is that you get to see the effects within hours. SEO A/B testing activities on the other hand take time to give you concrete evidence and effect of your tests. Even after you make sure your content is right, keywords are optimized, website tweaked for user experience, it’d be days, if not weeks, before you get to know if you’re on the right track or not. No matter how much you put in your SEM strategy the heart of the matter lies in the cost involved. 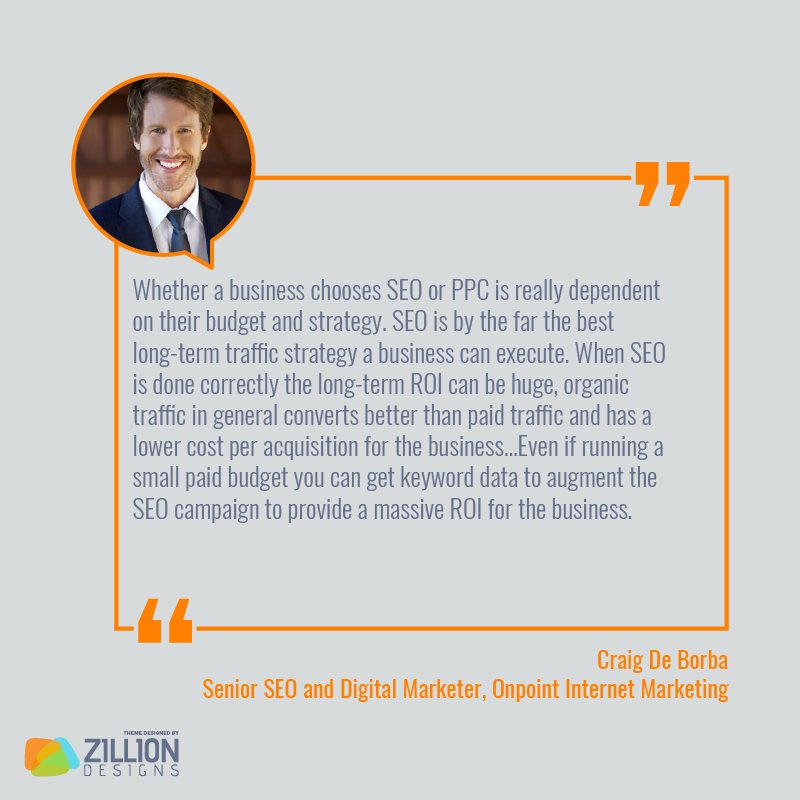 SEO vs. PPC in its basic essence is cost vs. time. So the question is what are you willing to spend, time or money? There is no correct answer of course. With SEO you have to spend time, effort, technical resources (web designer, developer, SEO expert). Whether you decide to hire an agency or do it yourself, the cost factor still remains. PPC costs just as much (or even more) depending on how much are you willing to pay per click. 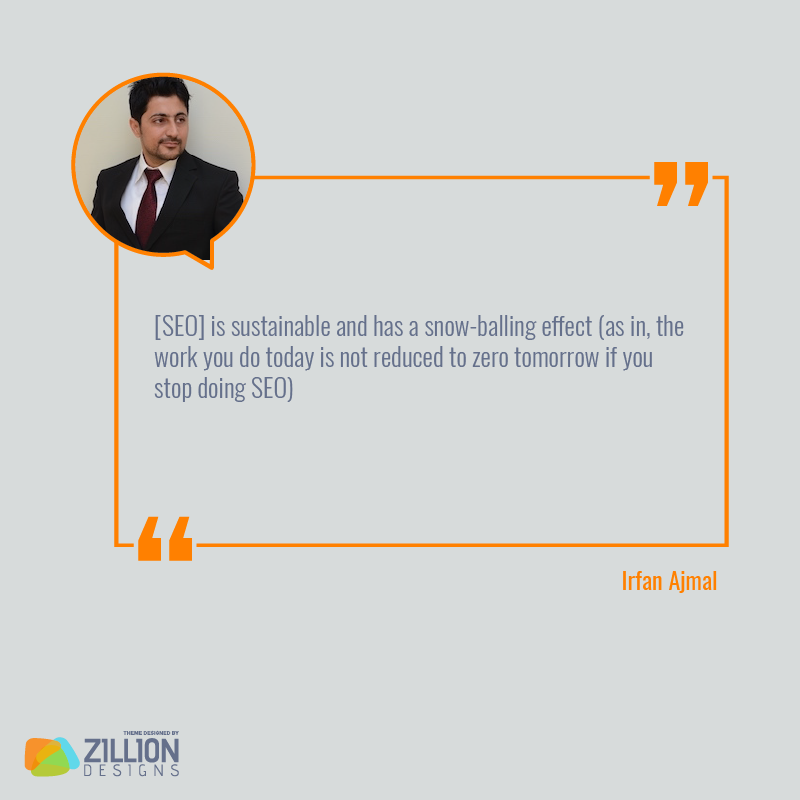 “[SEO] is sustainable and has a snow-balling effect (as in, the work you do today is not reduced to zero tomorrow if you stop doing SEO)”. PPC on the other hand is a variable cost that changes according to the type of campaign, keywords, and competition. The margin for return is less where PPC is concerned. 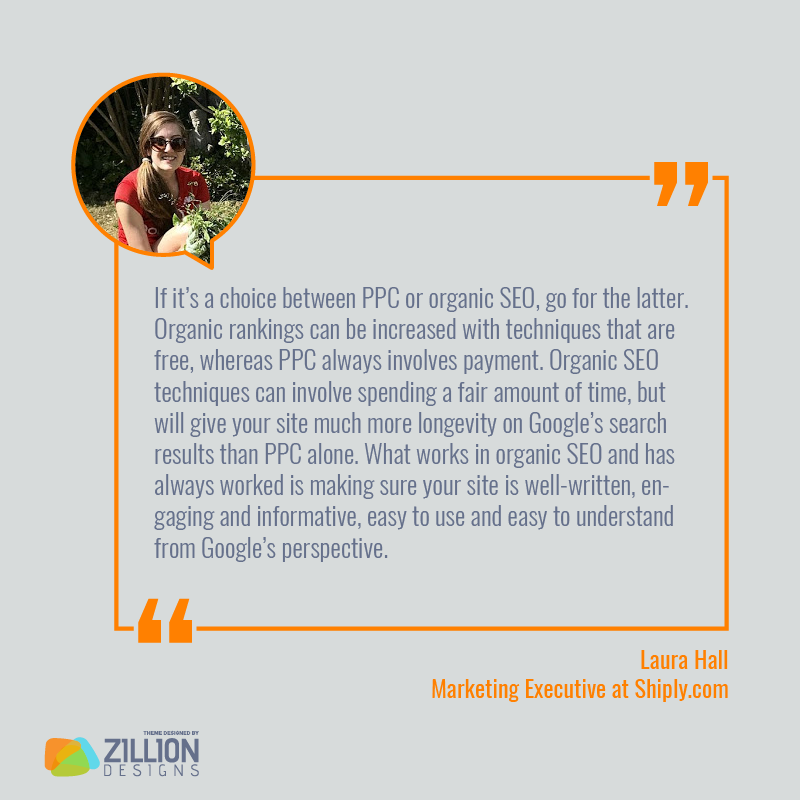 Since 40 percent of online revenue is captured by organic traffic, the obvious choice is SEO. But don’t take my word for it, Jack. In an ideal world, SEO should be your safe bet, while PPC with effective CTR, CPC, and ROI should be the backup. But who’s heard of this ideal world? Make your decision based on your business’ position and how much you can afford. Over to you. Which should business owners go for, PPC or SEO?